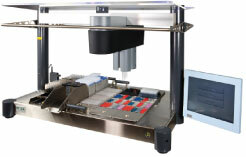 Robotic pipetting liquids adapt and integrate with any application protocol and the laboratory. Its flexible and easy configuration to adapt all types of liquid transfer protocol and integrate any external device into the system. Different sizes: 75cm, 1m ó 1,5m. Agility to adapt 1,2,4 or 8 pipettes. The aspitation and dispensation system is by air displacement. The system does not use liquid. Configurable with one or two arms. One arm can incorporate a 96 tips head. It is an imaging reader that provides full automatic analysis to microarrays. Allows you to define different types of arrays in wich the focus position of these varies from one type to another. -Easy set-list with discharge barcode samples and test plates. -Different test can be processed in the same process. -Database searchable by date, test sample or photo ID. -Funcions "backup" result and pictures, export and import of reading profiles with a single "click". -Result report of full plate or image shows result and gross values. 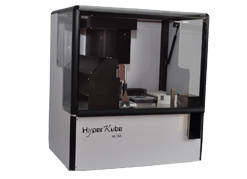 A compact, automated user-friendly instrument which provides two solutions for the laboratories. This is an IVD ready robotic magnetic bead based extractor suitable for difficult clinical samples. Processes samples from primary tubes to purified Nucleic Acid in minutes. It offers easy set up, straight out of the box, and with only a few minutes needed for configuration, you'll be ready to start scanning in no time at all. DataPaq Single Our Single-Tube Scanner, like all Ziath scanners, offers easy set up, straight out of the box – along with just the kind of portability some lab work requires. With only a few minutes needed for installation, you'll be ready to start scanning in no time at all. Ideal for benchtop use, or simply take it with you along with your laptop. Like all our scanner products, the Single Tube scanner is very fast – just hold the tube in the lens window and the read shows immediately on screen. The Ziath Automated Plate Stacker has been designed to efficiently supply and remove microplates from a set position within an automation operation; for example feeding open plates to a plate sealing device or supplying pre, or retrieving post-worked plates from an automation cell or system. Programable time up to 24 h.
It can be allowed to set up to 3 segments of time phases and temperature ramps. UVS-99 UVS-99 gives higly accuratefull spectrum measuresments with micro-samples (sepectrum range: 200-850nm.). Simply pipette 1-2.5 ul. sample on to the pedestal, laying down the sampling arm, UVS-99 can automatically complete the measurement within 10 seconds. NAS-99 is a special spectrophotometer for nucleic acid measurement. The lamp source is UV-LED. It can accurately measure nucleis acid samples, and is no need to dilute hight-concentration samples. Simply pipette 1,5 - 2,5 ul. sample on to the measurement process within 15 seconds. ・Protein (A280, Lowry BCA, Bladford),…etc. The SLAN Real Time PCR System enables the performance of ral time PCR with rapid cycling of up to 48 samples. Peltier technology is used by the system for the PCR process, and the fluorescence signal is detected throught a high-sensitivity photoelectric system making the process of detection more accurate and stable and highly repatable. ACTGene Gradient 96 well Real-Time PCR Instrument (FRTTC-96-G) is a high-performance, fullfeatured gradient real-time quantitative PCR instrument designed to accommodate basic experimental design and offer flexibility required for more advanced applications.